How to replace hyphenation with variable space size? I have been searching for an answer for this question for too long now. I have tried different hyphenation commands and packages but they don't seem to work. My problem is that I am writing my text in finnish and LaTeX generates a lot of hyphens in it. Finnish as a language has many long words so you can imagine what the text would look like at its worst. Is it possible to disable hyphenation and use variable space sizes to pad in the rest of the content automatically? 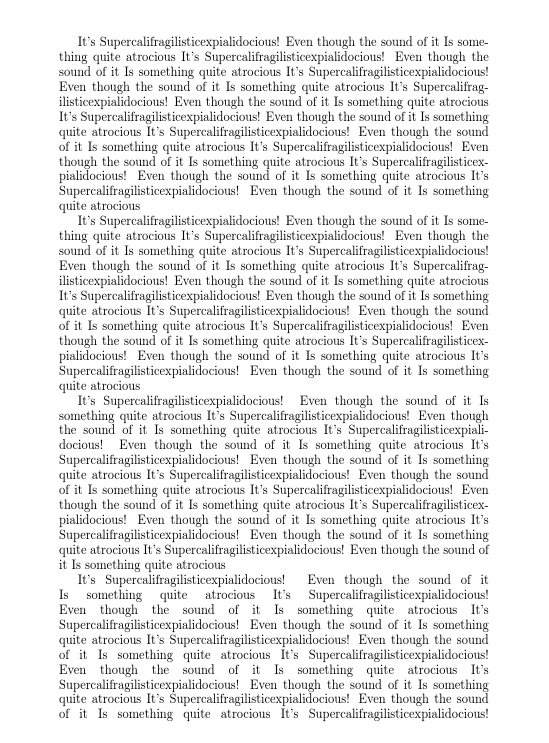 Word seems to be capable of this. EDIT: I will make a clarification: I do not mind if the generated spaces have big differences between them. I just want a way to replace the hyphens with variable space size without making major modification to the text. It's not difficult to avoid hyphenation, if you are willing to accept very lousy typesetting. 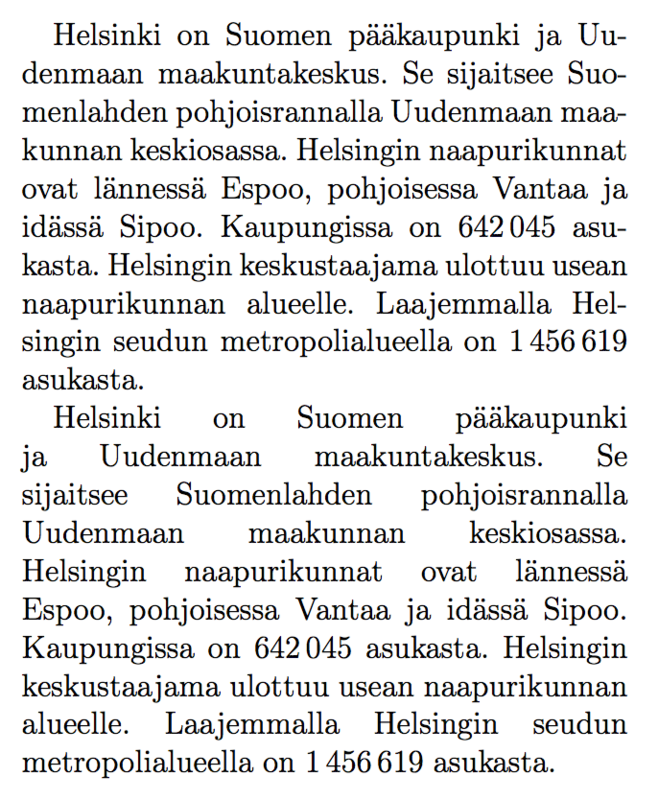 Helsinki on Suomen pääkaupunki ja Uudenmaan maakuntakeskus. The same in one column format. I'm not sure why you don't want hyphenation: it has been a common typographic device for centuries. TeX has many parameters that you can use to control the relative desirability of stretching space and hyphenation. LaTeX has to default configurations, \fussy and \sloppy. It may be that you would be happy with the \sloppy setting which allows more space stretching, but the example below shows two more "even sloppier" settings that increase the penalty for hyphenation. Not the answer you're looking for? Browse other questions tagged spacing languages hyphenation or ask your own question. How does TeX's hyphenation algorithm work?